Herding is the topic of today’s behavioral economics podcast foundations episode. This concept is similar to the way animals herd and for many of the same reasons. For safety, being in the center of the herd offers protection from predators. There is also an assumption that if everyone is running in the same direction they must know where they are going. My husband and I just got back from a trip to London, where I observed examples of herding, the subconscious versus conscious brain, and how a nudge can remind us to do what we need to. (I will talk expand on nudges in my upcoming foundations of choice architecture series). 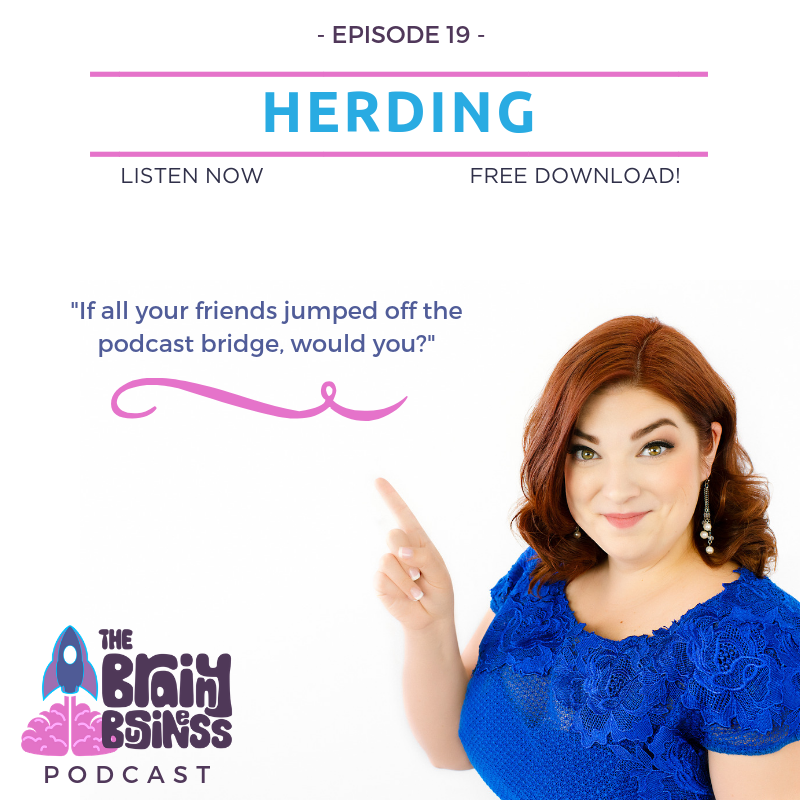 During this episode I will give examples of how to use herding to your advantage in business, and how herding can go terribly wrong. [06:23] Crossing the street in London is an example of the subconscious brain versus the conscious. Cars come from you on the right. London gives tourists a nudge by painting “look right” and “look left” at the intersections. [08:10] In behavioral economics we expect people to make errors, there’s just too much going on for the brain at one time. A little nudge can help us when we anticipate an error. [18:19] Humans herd in the same way as other species – including wasps and schools of guppies – for much of the same reasons. [18:43] It’s beneficial to be as close to the center of the herd as you can. [19:30] running the same way as everyone else is another concept of herding. A great example of this is watching groups of people cross the street at a busy intersection. [22:01] One of the reasons our species has adopted herding is because it helps us learn by observation. [23:26] The childhood discomfort of not doing what everyone else is doing is fueled by our basic instinct of herding. [24:29] In addition to safety, herding is a key way that we learn. Learning by observation is critical to our survival and growth. [25:48] Choosing a full restaurant as opposed to one that is completely empty is an example of herding. [26:55] Seeding a tip jar with money is another example of herding. [27:35] Museums in London had giant jars of cash encouraging people to donate. [29:09] Herding mentality is more likely to come out when people feel vulnerable or unsure of themselves. [30:58] Herding behavior can come into play with finances and when your reputation is on the line. [33:02] Studies have shown that up to 75% of participants will give an answer they KNOW IS WRONG to go with the group. [33:27] It takes strong will and conscious focus to be willing to go against the group and it is even more difficult when those people are like you. [34:45] Herding is one reason that things go viral. [35:57] In finances, people being afraid to go against the cumulative advice of the herd is one reason why markets crash and bubbles burst. [37:46] Crypto is absolutely impacted by the herd mentality – we see people make millions and feel more optimistic we can have that same fate if we act fast! This is also incorporating the concept of availability. [39:08] Don’t let herd mentality force you into making a bad decision. Turn on your conscious brain when you feel the anxiety building. [39:44] An example how you could use herding and the power of numbers to get hotel guests to reuse their towels. [41:52] People like to be part of the group. This is increased when the people are comparable and more similar to you. [42:54] Any time you can provide reassurance through numbers, it will increase the chances of people buying. [43:39] Herding and the ice bucket challenge. People participated because it was less painful to do it than to be ridiculed for not doing so. [45:20] Being in a group makes us feel safe and happy because of this release of oxytocin. [45:57] Helping leaders build a following. Recognize the power of existing affinities. Encourage the formation of new affinities. Fight the herd instinct in yourself. [48:55] Derek Severs How to Start a Movement is one of my favorite Ted Talks. [51:38] Social media is rife with herd mentality. Most people do not want to stand out by leaving a comment. [53:53] The feeling of getting comments and shares on social media can release oxytocin. [54:37] You can use herd mentality as an advantage in business by being generous with your social likes and shares – an example of a challenge I am currently participating in.